What are you doing today? This image is from last year. I will be trying from a different location this year. This image, and the images in the set it links to, were shot from Coronado Island. I think I was a little too close to the action for the image I had seen in my head while I was waiting for the fireworks. So I have scouted a new location for this year. We will see shat we shall see tomorrow. 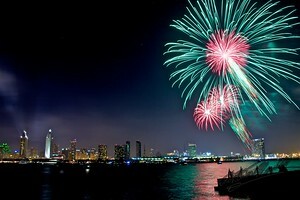 This entry was posted in Building Exteriors, Cityscape, Event, Fireworks, Lovely Light, Purchasable - As Art Prints, Sea, Water. Bookmark the permalink.